A passenger plane thought to have been struck as it approached Heathrow airport was probably not hit by a drone after all, the government says. Transport Secretary Patrick McLoughlin told MPs it was now thought what happened "was not a drone incident". Air accident investigators said they had not ruled out a drone but had no evidence to support the suggestion. 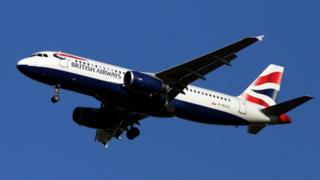 An investigation was launched after the pilot of a BA flight from Geneva on 17 April said an object struck the plane. At the time the Metropolitan Police said the plane was flying at about 1,700ft (580m) over the area of Richmond Park, in south west London, at the time of the incident. Even if the Heathrow drone strike wasn't a drone at all, and we'll never know for sure, the near misses are coming at an alarming rate. The latest statistics show that on Valentine's Day, a drone came within 20 to 150ft of an Airbus A320 near Biggin Hill in Kent. The British Airways plane was flying at 12,500 feet. Drones are not meant to go above 400ft. The crew reported it was "six feet wide with a red flashing light". It was all over in seconds, there was no time to react and they never found the drone operator. There were 40 drone near misses in 2015 and just nine the year before. Hence the calls for urgent action to prevent an accident. Many pilots feel it is a matter of time before a drone hits a plane, and they simply don't know what will happen if it does. But BBC Transport Correspondent Richard Westcott said air accident investigators had stopped their investigation because "there is nothing to look at". Our correspondent said the item, which struck the front of the aircraft, could have been "floating debris". "They just don't have any evidence to tell them one way or the other," he added. The Airbus A320 was carrying 132 passengers and five crew as it approached the airport. It landed safely. The incident had been thought to be the first drone collision with an aircraft in the UK. Are drones dangerous or harmless fun? The UK Air Proximity Board - which investigates near-miss incidents in UK airspace - says there had been a number of serious near-misses at UK airports involving drones. The head of the International Air Transport Association, Tony Tyler, earlier this year warned that drones flown by the general public were "a real and growing threat" to civilian aircraft. iWonder: Drones - Deadly robots or useful machines?